Mahatma Gandhi has been studied extensively as a multifaceted personality from the backdrop of India’s freedom movement. Volumes have been written about him. His world-view and his ethical and spiritual self-discipline as well made him an unparalleled persona of his time. This book portrays him as a philosopher of action (karmayogi), an ideal in which he was deeply rooted, than a philosopher (darsanik). 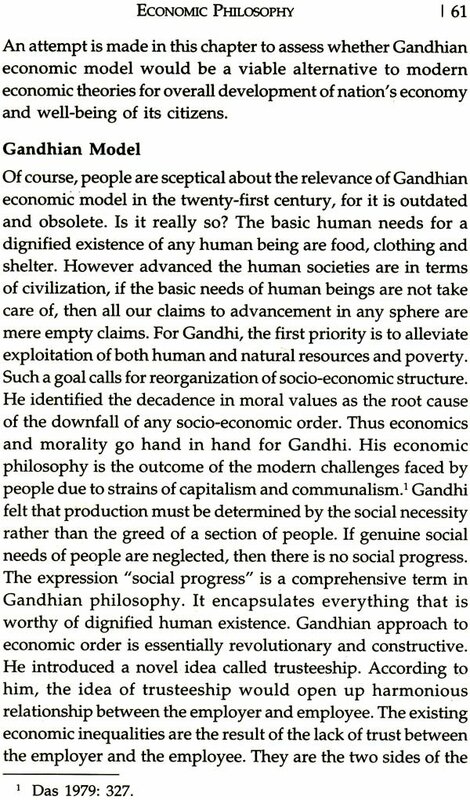 While discerning the Gandhian idealism, this study analytically examines the different qualities of Gandhi such as his firm belief in peace as an embodiment of spirituality, his approach to conflict resolution, his world-view on corruption and human values, his economic philosophy and his outlook on socialism vis-à-vis that of Karl Marx, among others. It also makes an endeavour to reappraise Gandhi in the present-day context. The book, therefore, attempts to familiarize Gandhi to the present generation and reminds us that Gandhian thought in all its aspects is still relevant in this era of globalization and suggests many ways to overcome or face the challenges of modern consumerism, absorbing the quintessence of a karmayogi. This book aims at invoking keen interest among people of different walks of life, be it academia, students, or common populace, who would like to know more about Mahatma Gandhi’s ever-enticing personality. K. Srinivas (b. 1955) received his MA and ph. D. from Andhra University, Visakhapatnam, and Jawaharlal Nehru University, New Delhi, respectively. He taught at Madras Christian College between 1985-89 before moving to Pondicherry University. His fields of interests are epistemology (Eastern and Western), analytic philosophy, philosophy of science, modern logic and Hinduism. His books include: An Evaluation of A.J. Ayer’s Logical Positivism (1989); A Dictionary of philosophy (1991); P.T. Raju (2001); A Concise Dictionary of Philosophy (2007); Morality, Freedom and Social Construction (2010); Logical Positivism Revisited (2011); Buddhist Ethics in Impermanence (2011); and Philosophical Fragments (2012). Prof. Srinivas presented papers in the national and international seminars and published a number of papers in the reputed journals of philosophy. He is a visiting scholar at many universities in India and abroad. So much is written and discussed on Gandhian thought since 1950s. Knowing very well that Gandhi is no more a fertile area I undertook this venture of publishing some of my reflections on Gandhian thought concerning his robust idealism and its relevance to contemporary times. I personally feel that the very survival of Gandhian thought establishes the fact that it is not a rigid set of doctrines to be read as a fairy tale but has inbuilt elasticity to be practised by the generations of people for the preservation of life and society. The present work is an attempt to highlight the central doctrines of Gandhian idealism and their impact on human societies. We must keep in mind that no philosophical doctrine is foolproof or immune to revision. Every philosophical doctrine is susceptible to criticism. In that sense, Gandhian idealism is not an exception to this rule. Of course, the changing social and political circumstances necessitate a radical shift in our ideologies too. The contemporary developments in the realm of science and technology ushered in new human relations and values. Also, we are witnessing lopsided development of societies all over the globe which deprives certain privileges to a section of people. The gap between the rich and poor is widening day by day. The economic and social imbalances rob people of their human dignity. The supremacy of machine over man gradually transformed human condition into a state of despair. To resurrect human race from such a state of despair there is a need to revitalize human values. The life without human values is like a ship drifting in the mid-sea without a pilot or a helmsman. Human values guide us through the difficult situations. A welfare society worth the name cannot afford to ignore the existence of human values. The ideal of any welfare society is to fulfil the basic needs of people and to protect their fundamental rights. Gandhi time and again reminded us of the importance of human values. Gandhi's philosophy of action is a direct outcome of his faith in the teachings of Bhagaoad-Giia. But his philosophy of action is based on the principle of nonviolence (ahimsa) which is not only extended to one's deeds but also to thought and speech. Thus Gandhi can be befittingly called a radical pacifist. The influence of Christianity, Buddhism, and Jainism are also conspicuous on Gandhi. He admired and assimilated what is best in other religious faiths without alienating from his own Hindu faith. Nonviolence, compassion, and love must be part of our social actions, according to Gandhi. But these virtues cannot be solely expressed in the individual's actions but must also reflect in the social and political life of individuals. An individual as a moral agent cannot live like a recluse. Every individual's life is entangled with the life of community, society, nation, and humanity. Throughout his life Gandhi tried to bring both individual and social spheres together for it is a contradiction in terms to call someone individually good and socially bad, and socially good and individually bad. Gandhi thought that India would be a right nation where he can experiment with his ideals successfully. As an Indian he knew the mentality of his fellow Indians and their faith in the scriptures. Another important factor to be highlighted is that like Socrates, Gandhi always respected his inner voice (conscience). By and large, all his actions are guided by his inner voice. He firmly believed that the three methods of action - nonviolence, compassion, and love - are the only legitimate means to establish peace and harmony in family and communal relationships, internal politics of nation, and international relationships. Gandhi never deviated from his path and even went to an extent of threatening his followers that he would retire to forest if they did not shun hatred and violence. Perhaps Gandhi was lucky enough to have trusted and disciplined followers. The confidence in his followers made Gandhi to challenge even Hitler to face his unarmed army of nonviolent, compassionate, and loving souls if he invaded India. Of course, these challenges of Gandhi make us think that Gandhi was daydreaming. Gandhi's philosophy of action manifested in his practice of satyagraha. It is often interpreted as "passive resistance" or "nonviolent resistance" or "civil disobedience". But Gandhi did not mean any of these things. They are only corollaries or aspects or results of satyagraha, which means "passionate adherence to truth". Truth being the law and support of the universe cannot be ignored by any individual. Nonviolence and compassion are the two aspects of Truth. There are believers and non-believers in the existence of God, but there is none who can deny the existence of Truth. This is the reason why Gandhi equated God with Truth. Disobedience of civil laws, which spread evil, is also a kind of resistance. Truly speaking resistance is not passive. With love and nonviolence, Gandhi held, we can transform our deadliest enemies into good friends. The application of the robust idealism of Gandhi to social, political, and international fields is not an easy affair. It certainly requires many provisos and adjustments. At the end of the British rule Gandhi realized that his robust idealism can be practised only at individual level. Gandhi alone could truly practise what was upheld by him. Unfortunately the pragmatic world in which we live is not what Gandhi thought it to be. The limitations imposed on the effectiveness of Gandhian idealism only speak about the kind of reality that we face today. Poverty, illiteracy, and lack of proper health care are of great concern to every nation. Greed, dishonesty, degenerated moral system, and lack of commitment to social duties deprive human beings of their dignity. There is no doubt Gandhian idealism offers great hope to humanity. The present work contains seven chapters. The seventh chapter is a book review. I chose to include it in the present work as the author, Ram Chandra Pradhan, in his book Reading and Reappraising Gandhi provides us with an overview of Gandhian idealism and the ways in which it was interpreted. I express my deep sense of gratitude to Prof. K. Ramakrishna Rao, formerly Chairman of Indian Council of Philosophical Research (ICPR), New Delhi, and currently Chancellor of GITAM University, Visakhapatnam, for encouraging me to write on Gandhian thought by extending invitation to take part in the national and international seminars held in the Centre for Gandhian Studies at GIT AM and for Gandhirama in New Delhi. My interaction with Gandhian scholars made me realize the significance of Gandhian thought today. Also, I sincerely thank Prof. Christine Chojnacki, Chairman, Centre for Indian Culture at Jean Moulin University at Lyon 3, France, for extending me an invitation as visiting professor. The interest evinced by the faculty and students of Jean Moulin University on Gandhi compelled me to pen down my reflections on Gandhian thought. I cannot forget the moral support extended by my friends Prof. S. Pannirselvame, Dean, School of Humanities, Pondicherry University, and Dr Clement Lourdes, Associate Professor, Department of English, Pondicherry University, while pursuing the present project.